HERALD OF A NEW ERA in distant signalling at sea. 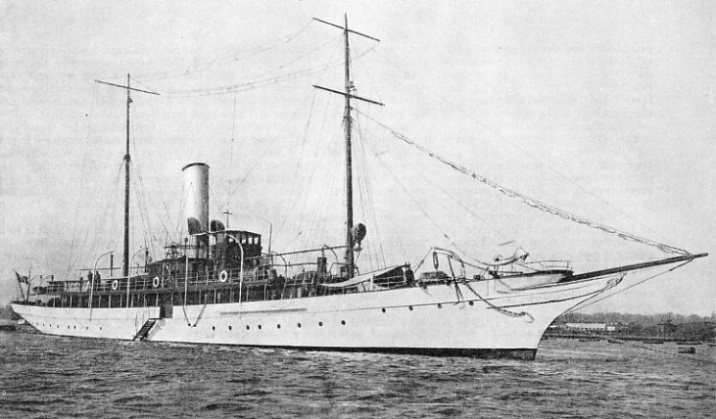 The yacht Elettra, 633 tons gross, is equipped by Marchese Marconi as a floating laboratory in which experiments in long-distance wireless communication are conducted. By the use of wireless world-wide communications can be made where formerly distant signalling was limited to the range of vision. THE perfection of wireless telegraphy has been the cause of distant visual signals at sea falling into disuse. There is no doubt that some such boon to seafarers as wireless was much overdue. Few things could have been more complicated and clumsy than some of the methods of signalling at long ranges which were provided for ships in the preceding years. The real value of sail signals came from their being visible when one vessel was hull down to the other, or even twice that distance. If a man were sent to the masthead with a telescope, two ships could communicate, even when they were entirely invisible to one another from the deck. In this way ranges of from twenty to thirty miles might be covered. Burney’s Young Seaman’s Manual, one of several text-books that devoted some attention to signalling, will help us understand how the sail signals were operated. Instructions on the subject were contained also in the Admiralty signal books from 1859 to 1879. Two top-gallant sails and two royals were used; or in smaller vessels without royals, topgallant sails and topsails. There were two methods, “exhibited furled, and loosed” and “exhibited furled, and set.” Men were kept on the yards to let fall or pick up the canvas as required. 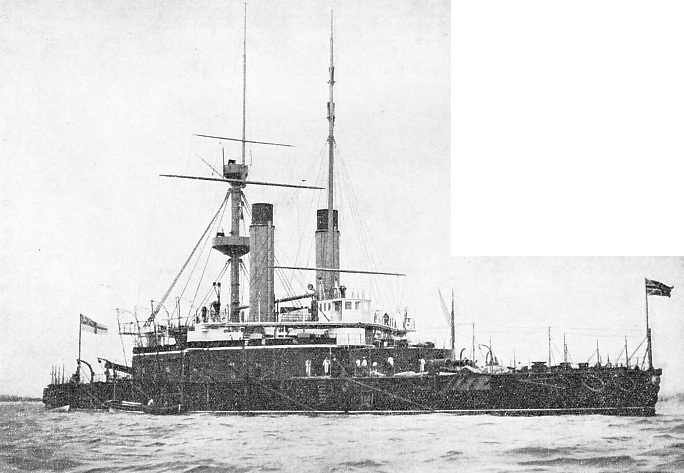 The Admiralty instructions said also, “If the distance be so great, or the position of the ship, as respects land, or other circumstances be such as to render communication by Distant Signals impracticable, recourse must then be had to Sail Signals.” This throws some light on the relative range of the system. feet long, with a beam of 73 feet and a mean draught of 28 ft 10-in. Of almost equal antiquity with sail signals was the wheft. Spelt variously as waft, waif, whiff and weft, this word has been through a number of vicissitudes and has often changed its meaning. For the last three hundred years or so, however, it has generally been recognized as a distant signal and almost always as denoting distress or urgency. Sir Henry Mainwayring wrote in 1644, “Wafts are used for signes to have the boate come aboord (which is Coate, Gowne, or the like hung-up in the Shrowdes); also it is a common signe of some extremitie, when a ship doth hang a waft upon the main-stay.” About a hundred years later, the weft was mentioned in the Sailing and Fighting Instructions for His Majesty’s Fleet, when it could be made with the topgallant sail, as part of the distant signal upon discovering a strange sail, or with the jack or the ensign to signify distress in time of battle. It is not clear how a sail could be made into a wheft, and opinions have differed as to the method of making a flag into one. Falconer’s Marine Dictionary of 1769 speaks of hoisting the ensign furled up into a long roll, and other authorities convey the same impression that a wheft would appear as a sort of long flexible roll of cloth. Other writers in modern times seem to think it was made by tying a knot in a flag; but it is difficult to see how this would be feasible unless the flag were a long, narrow piece. The printed naval signal books of the 1790 period, however, generally contain the following kind of description: “Whefts. To speak with the Admiral. And is to be repeated by intermediate ships discovering it, until seen to be observed by the Admiral. After which it is to be continued only by the ship in which it was first exhibited. N.B. - The Whefts to be made by any flag, stopped only at the head, the fly loose.” In this way the wheft would appear to be an enormous tassel, and this must have been the true wheft. Its meaning here was, obviously, “urgent information”. In the transitional year for practising the revised (1931) International Code, that is, during 1933, it was laid down that, when exercising the new code, a “weft” was to be hoisted. The Board of Trade explained that this was to consist of the code pendant with its “tail” tied to the halyards, or in a strong wind the same flag tied in the centre. The tying of the fly to the halyards did not constitute a proper wheft, as reference to the old International Code will show. Signalling with flags generally fails either when there is not a breath of wind and the flags hang down in confused folds, or when the distance is too great for their colours to be distinguished. In 1849, Captain Liardet, Royal Navy, proposed his “Calm Weather Signals”. They consisted of fourteen canvas balls painted in different colours. Marryat’s famous Code in its later years included “geometrical” shapes made of canvas on frames, coloured red, blue and yellow, and consisting of rectangles, triangles and hexagons. In 1854 an ingenious American named Henry J. Rogers designed a set of flags with the bunting so sewn together that their identities could he distinguished whether they were blowing out or drooping inert. None of these plans was widely adopted, though Rogers’s plan certainly deserved to be adopted. THE CURVATURE OF THE EARTH’S SURFACE affects the visibility from ships’ decks. The ships to right and left in the diagram are hull down to the one in the centre, though she can see all their sails. The two outer ships are entirely invisible to one another from the deck, though the topgallant sails of the one can be seen from the cross-trees of the other. By signalling with the upper sails, ranges up to twenty or thirty miles could be covered. In the diagram the curvature is intentionally much exaggerated, as are the sizes of the ships. To remedy the failure of colours at a distance, the most general plan was to employ flags of enormous size and unspecified colour, and to rely upon their permutations of shape and position for composing a code. The use of a black canvas ball in combination with distant signal flags is of ancient origin and was common for some time before the end of the eighteenth century. That the long-distance code was used in Nelson’s day has been shown by an incident that occurred two days before the battle of Trafalgar. On October 19, 1805, the line of look-out vessels was passing in to the Commander-in-Chief the important message, “The enemy’s ships are coming out of port.” It is on record that the coloured code flags hoisted on board H.M.S. Mars, the last in the line, were not answered by the main fleet, so they were hauled down and distant signals substituted. This was done by hoisting a ball, pendant, square flag and pendant at the main, and a ball at the fore. The two balls signified 300 and the flags 70, making 370 in all, which was the number corresponding with the signal already mentioned. The effect of receiving such a message was immediate and sensational, as it was the message which Nelson had been so anxiously awaiting. In the Commercial Code, which later became the International Code of Signals, a distant signal system was at first provided, making use of balls, pendants and square flags much on the lines of those already in existence. It seems to have been a mistake not to have made this system more flexible by using more than one mast and thus allowing the different symbols a greater variety of values. The system of shapes, however, seems never to have been put into practice. The reason is that, although an ordinary well-equipped ship might carry the balls, and even the cones, no provision ever appears to have been made to supply drums, namely the square or cylindrical canvas shapes. Certainly no ship’s staff could be expected suddenly to manufacture such an article on the rare occasions on which a distant signal might be required. “MY SHIP IS ON FIRE”. The two sail signals on the left of this illustration represent the numerals 6 and 5, In Chapman’s code of signals, dated 1859, these numerals represent the message “My ship is on fire”. The signal on the right shows the sails set by a ship about to reply to such a message. Chapman’s code was intended for use by merchant ships, but sail signals were used in the Royal Navy from the earliest times. There was, also, a far deeper objection to employing these cumbersome codes. In the earlier times the symbols had had a numerary value, and when distant signals were used at the time of Trafalgar, the number was obvious and the meaning could be looked out in the signal book opposite the figures. In the International Code, letters of the alphabet took the place of figures, so that to denote its letters more than one numeral group had to be displayed before the phrase in the Code could be referred to. It is generally believed that the much simpler distant Distress Signals were often resorted to, but here there was nothing complicated; ball over square flag, or square flag over ball, or anything resembling these symbols was sufficient to denote some form of “wanting assistance”. In a boys’ book called The Gold Ship there is a description of a steamer in distress with broken shaft, hoisting “bucket over hatchway cover”. It is not plain what this refers to, but no doubt in an emergency a wooden hatch cover might be made to serve the purposes of the “square”. Vice-Admiral Philip Colomb was an eminent naval inventor, and there are occasionally read accounts of the Royal Navy carrying out trials of some of his signalling apparatus round about the period 1870-90. This apparatus included a variety of strange and ugly-looking black objects, cones folding up in the same way as umbrellas, and drums collapsing as Chinese lanterns do. These signals were really an adaptation of a once important arrangement known as Redl’s Cone Telegraph. This consisted of four huge cones, joined in pairs at their bases, which were formed of large hoops. The cones were collapsible into the hoops, and numerals could be signalled by closing and opening the cones in various combinations. SEMAPHORE STATIONS were established in series along many parts of the coast of Great Britain. A line of these stations was built in 1827 between Anglesey and Liverpool The station illustrated above was situated at Llysfaen, near Colwyn Bay, North Wales. It is said that the first ship reported by this line from Holyhead was the American ship Napoleon and that the message took only fifteen minutes to pass from Holyhead to the port of Liverpool station on Bidston Hill, Birkenhead. The sole surviving instance of a distant signal at-sea to-day is the “Distance Signal” of Distress, consisting of a square flag having either above or below it a ball or anything resembling a ball. This signal might yet prove useful in the event of the wireless apparatus breaking down. Although this is the only signal so called, it ought to be remembered that there are many offshoots of what were once a species of distant signals. Some of these are illustrated on page 252. A vessel employed in laying or picking up a submarine cable is to display two red balls (“globular in shape”), with a white diamond between them, each two feet in diameter. A vessel aground “in or near a fairway” will be required to carry three black balls, also two feet in diameter, and six feet apart. It is clear from these measurements that the shapes are meant to be visible at a long distance. Semaphores of different sorts were used in the Royal Navy, with varying degrees of success, from 1816 onwards. With one exception, they were employed only for fleet work and over distances not much in excess of a mile. The exception was the masthead semaphore, a contrivance intended for long-distance work and considered remarkably successful for that purpose at one period. It was introduced by Admiral of the Fleet Sir Arthur Wilson in 1895, and because it was placed at the truck of the mainmast, it was officially known as the “Truck Semaphore”. Its arms were twelve feet long, and the only limit to its range in clear weather was the curvature of the earth’s surface. The few years at the end of the nineteenth and at the beginning of the twentieth centuries witnessed the struggle for mastery between the truck semaphore and the newly installed wireless telegraph, both of which had their apparatus side by side at the masthead. Wireless gained the day and masthead semaphores were abandoned round about 1905 and 1906. AN IMPRESSION OF THE FAMOUS SIGNAL STATION on Bidston Hill, Birkenhead. Incoming vessels were sighted from this point. 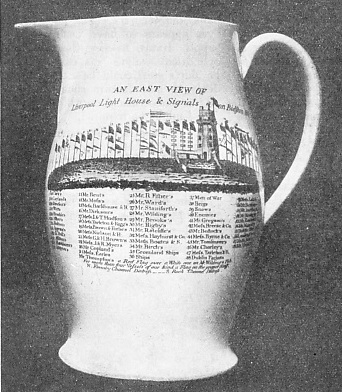 The jug illustrated was made in 1795 and shows the code of flag signals used, with a key of numbers and names below. The jug is now in the Liverpool Public Museum. There are still a lighthouse and an observatory at this site on Bidston Hill. When considering long-distance signalling between ships, it is appropriate to relate the share taken by the land stations in. keeping up maritime communication. On the continent of Europe there were some extensive systems of visual or “optical” telegraphs, the best known being that invented by Citizen Claude Chappe. In France, Germany and Russia telegraphs were established between inland towns and had little to do with ships and the sea. In England and Wales the only telegraphs ever built were essentially for the service of shipping, whether naval or mercantile, and for no other purpose. The directions of the lines and the names of the terminal towns and places alone would show the truth of this: London to the Downs, London to Portsmouth and to Plymouth and to Yarmouth, Deal to Yarmouth along the coasts of Kent, Essex and Suffolk, and Holyhead to Liverpool along the coasts of Anglesey, Denbighshire and Flintshire. The London lines radiated from the Admiralty and were used for sending orders to the naval ports and stations, and for receiving information brought in to the coast by our men-of-war. Before 1796 all such communications had been dependent on horse transport. The speed of the telegraph improved until messages occupied only a matter of minutes, but even if they had taken hours, they would still have outstripped the post-horse and the stage-coach. The East Coast chain consisted of a continuous series of semaphore stations, not worked with arms, as are modern semaphores. These stations could pass messages quickly along the line or signal to ships in the offing. The chain included such well-known Kentish, Essex and Suffolk posts as Ramsgate, Reculvers, Shoeburyness, Clacton, The Naze, Harwich, Landguard, Aldeburgh, Southwold and Lowestoft. Later on the examples set by the Admiralty were followed by people connected with shipping concerns. In 1827 the famous line of signal stations from Anglesey to Liverpool was built. Most of its stations were situated at some point on the coast familiar to seamen sailing out of the River Mersey - Holyhead Mountain, Point Lynas, Great Orme, Hilbre Island and Bidston Hill. As a ship arrived in sight of Holyhead and established her identity, the news was quickly transmitted to Liverpool, often in a few seconds. Communication with the ship could be kept up, if necessary, as she passed along the coast to her destination. A similar privately-owned line ran from London Bridge to the Downs in 1842. The Admiralty occasionally made use of this after its own line had been abolished. The two most famous of all the lines were undoubtedly the Admiralty-Portsmouth line, which operated successfully from 1822 to 1848, and the Holyhead-Liverpool line, which worked continuously from 1827 to 1860. These were abandoned only because of the arrival of the electric telegraph. In the United States a similar line ran from the island of Martha’s Vineyard to Boston (Mass. ), through sixteen stations and over a distance of seventy-two miles. This was at the beginning of the nineteenth century and the apparatus was similar to Chappe’s semaphore. Communication in the interests of arriving and departing vessels was kept up from 1801 to 1807. Although the foregoing systems ran across country, they have been dealt with here because they were long-distance systems and were intimately concerned with shipping. The shore-to-ship distant signals were given up comparatively recently. For the best part of a hundred years the coasts of France bristled with semaphore posts which carried three long arms and were extremely valuable for communication with ships passing in the distance. In later years there were as many as a hundred stations in France and about thirty more on her Mediterranean seaboards, and all were linked up internally by the electric telegraph. Other countries also installed the same apparatus and thus the movements of ships all over the world were able to be published immediately and their owners’ instructions sent to them when they were far out to sea. A TRUCK SEMAPHORE was installed in H.M.S. 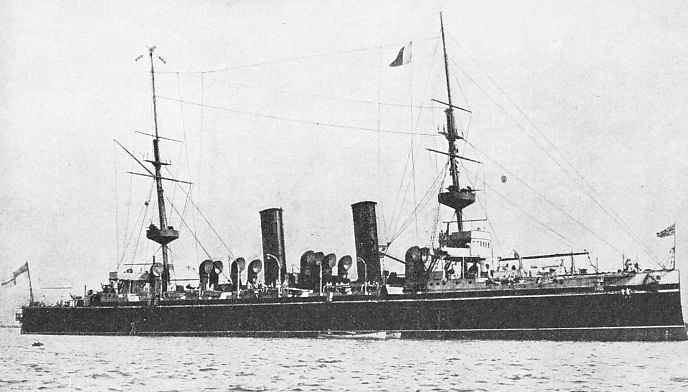 Minerva, a cruiser of 5,600 tons displacement built in 1895. Introduced in that year by Admiral of the Fleet Sir Arthur Wilson, the apparatus was placed at the truck of the mainmast. The semaphore arms were 12 feet long and were visible for long distances. They could be trained round to signal on all bearings. You can read more on “Buoys and Beacons”, “Day and Night Signals at Sea” and “Signalling at Sea” on this website.